Pesto Comparison and the winner of a kitchen herb garden! Once again, I was super excited to read all the entries for the herb garden giveaway. I now have lots of new ideas for using the fresh herbs I’ve started growing in my kitchen and I can’t wait to try them all. You will definitely be seeing some of the other entries in future posts. There was a great variety of ideas from using fresh rosemary in pizza crust to iced tea made with mint leaves. All sounded delicious! Finally, the winner of the herb garden giveaway is Deborah Rosen with her suggestion of making homemade pesto with fresh basil. I have never actually made homemade pesto and this comment inspired me to try out the recipe Deborah suggested from epicurious.com and compare it to store bought Buttoni Pesto. Thank you all for your creative suggestions and congratulations to Deborah for winning the herb garden! 1. Combine the first 6 ingredients (everything but the olive oil) in a small food processor and blend for about 10 seconds, just until finely chopped. Add the olive oil and continue to blend until a fairly smooth paste is formed. Serve with toasted baguette slices, crackers, or vegetables. Can be kept, refrigerated for up to 3 days. Homemade pesto is so easy and quick to make that time isn’t a huge consideration in this comparison. A few seconds with the food processor and your done! If you don’t have a food processor, I think a stick blender or regular blender would work pretty well too. Whatever you use, the appliance does most of the work for you and the most time consuming step is just washing up afterwards! Cost was not as big of a factor as I had imagined. The homemade and store bought pestos cost just about the same amount, even with the expensive ingredients required to make pesto from scratch. If you are lucky enough to have a pot of basil growing in your kitchen, the cost would be cut nearly in half, making the homemade version very cost effective. As usual, the most important element for me is the flavor of the products. Here there was some disagreement. Out of three testers, 2 preferred the homemade pesto while the third liked the store bought version better. 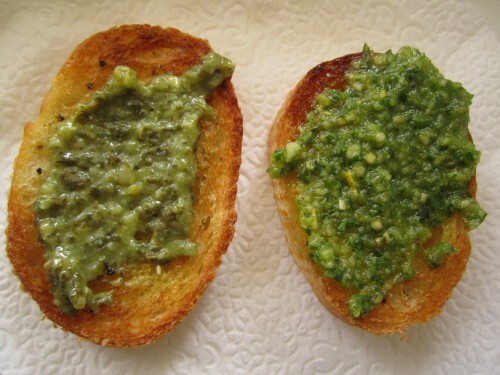 I personally liked the strong, fresh flavor of basil in the homemade pesto, but I can see the attraction of the milder, cheesier tasting Buttoni pesto as well. 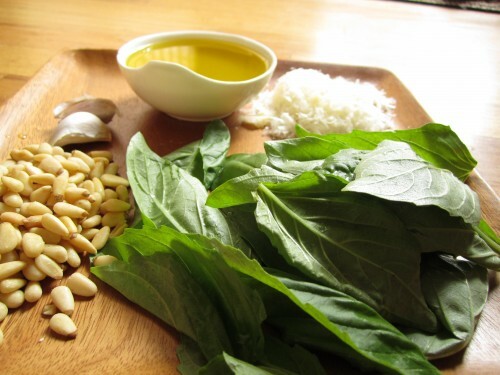 However, one benefit of homemade pesto is that it can be tweaked to fit your personal preference by adding more cheese, using less olive oil or fewer pine nuts, etc. Also, not as important as flavor but still a consideration, the homemade pesto was much brighter and more attractive looking than the store bought. The store bought pesto looking sort of grayish, putty colored when seen right next to the homemade and was not nearly as appetizing in appearance. Bottom Line: Homemade pesto is quick and easy to make and has a stronger, fresher basil flavor than store bought, although the recipe could be changed to taste more like the cheesier Buttoni pesto. Store bought and homemade pesto cost about the same amount and the homemade version is surprisingly quick and simple to make. I would highly recommend trying out homemade pesto and changing the recipe above until you find the combination of ingredients that appeals to you. Funny thing I made homemade pesto last night. I have a tub of basil growing on my back patio. A friend showed me she grows her basil and parsley in a tub high enough to keep the bunnies out. Also the soil around our new home here In DC isn’t great so I wanted to give the basil a fighting chance. I used Ina Garten’s recipe from her “Parties” cookbook. It calls for five times as muchbbasil and oil with ten times as much garlic. Also, in the past I’ve made my pesto and frozen it in ice cube trays, transferred to ziploc bags, then pulled out a cube or two in the winter when basil is scarce or more expensive to buy. It is tips like this that make me wish I had a freezer! Freezing the pesto in ice cube trays is a great idea! Someday . . .